First in the three volume series. Ex-lieutenant Eddie Gundersen returns to Belzagor on a scientific expedition to the borders of the indigenous lands, where he must face his nemesis, Kurtz, and his own inner demons on a planet which still has hidden secrets. 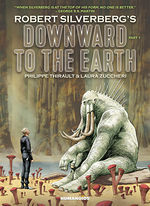 Downward to the Earth is a great example of a sophisticated, adult sci-fi drama. . . . it will have sophisticated sci-fi fans drooling over every page. At its heart Downward to the Earth is a good old-fashioned science fiction tale hearkening back to a time when cosmic was the operative word for several levels of any given scenario, like a throwback to Heavy Metal magazine. Laura Zuccheri brings art with a distinctly European magazine style, though it has the faintest air of vintage Weekly Shonen Jump as well. Her panels focus on characters, with thin, realistic linework, superb expressions, and clear bodies that stand out against fully realized fantastic backgrounds. 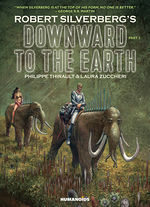 Downward to the Earth is an excellent science fiction graphic novel for those who love seeing vivid worlds and creatures. The story is intriguing as it tackles the complexity of respecting creatures, cultures, and your fellow man while being wrapped up in a beautiful package. This adaptation of Robert Silverberg’s extraordinary world is visual perfection. Downward to the Earth was not inspired by Cameron’s Avatar, quite the opposite. A gem. A true initiatory journey that transforms into a fight for respecting nature and accepting differences amongst people.